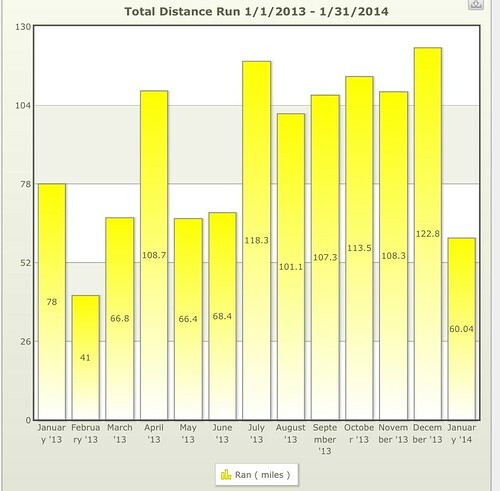 My hundred miles per month streak came to an end after six months. A combination of being busy at work, crappy weather, water in our basement and recovering from an ultra meant less running than usual. Like those excuses? That's exactly what they are. The truth is, I haven't been working that much extra, I have a treadmill I could use in bad weather, we hired out most of the basement work, and I only needed about a week off after my ultra. Laying out excuses makes me think of one of Jim's recent posts. My plank streak lasted until my fishing trip and I quit and never really got going again. I should really start back up. Having a strong core helps my running and helps keep lower back pain away. I was able to maintain my weight even traveling and eating out 100+ days and nights. Portion control helped out here a lot. Restaurants serve way to much food so I typically only eat about two thirds of it. I also eat salad for lunch quite a bit. I did hit 1100 miles for the year and I'm pretty happy about that, specially with all the traveling. Time to start a new 100 mile/month streak :-). 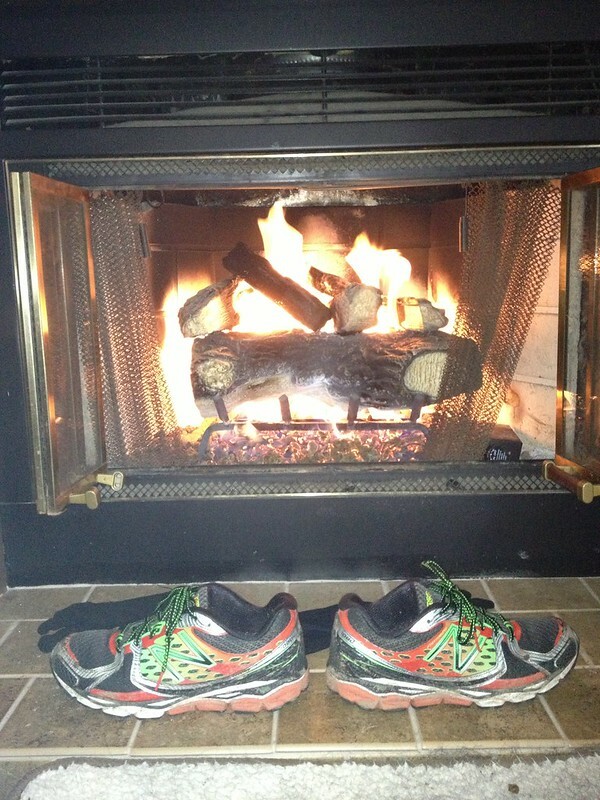 There is almost always a pair of my shoes and gloves drying in front of the fire. There are two more pair on the mantle ready to go. No shame in ending a streak. A streak is good only if there is some intrinsic value. Hence, like you, I need to get back on the plank a day wagon. For me, mileage varies depending on whether or not I am training and what I am training for, so I can't see myself having a mileage streak. But more power to those who do. All streaks that end give an opportunity for the next to begin. Game on. That was an amazing streak. To me, anyway. According to Daily Mile, I ran something around 400 miles in 2013. I need to up my game this year. I've been alternating planks and push-ups for the last month or so. It can only help me for running and biking. You could dust off your bike and join us for tomorrow's super century! And looks like the non-race will be April 5...you might out that on your schedule! Everyone needs a break sometimes. Plus, I know it's an excuse, but the weather has truly been awful lately. And sleet tonight! I was hoping for a long run tomorrow, but with a sheet of ice over everything, it looks like it may not happen. Here's a to a great 2014! I've already broken about 18 goals I had for 2014, one being a plank a day. That lasted 4 days. 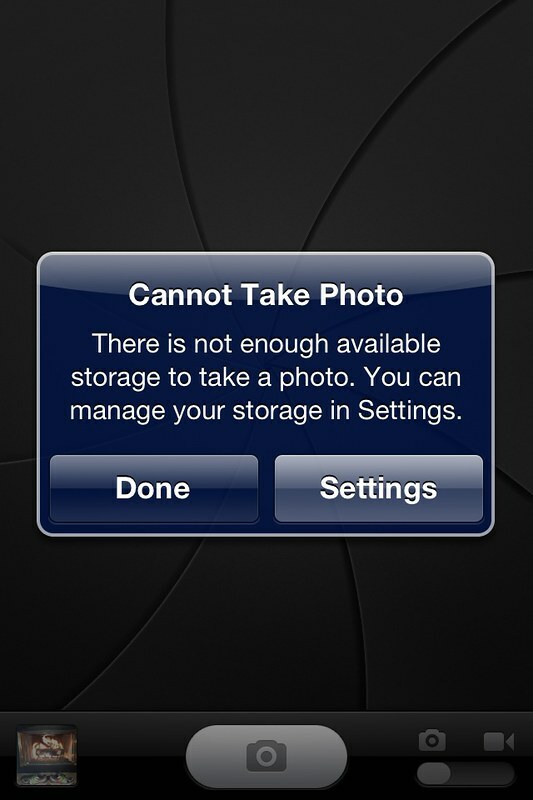 I always wondered what my limit on my phone was for pictures...so far I haven't reached it. I'd struggle to figure out which one to delete (certainly not any from Leadville :)). Good job on the weight and the mileage. Here's to a strong 2014...and I hope to see you sometime, another "Internet date" ;). Blah, I've been struggling with a maxed out phone too. Finally downloaded all the pics last night and marked I wanted the copied ones deleted. Didn't happen. A year without weightgain is success to me! Success on so many levels - congrats on a great year. Maintaining weight especially when traveling is huge. Good job. I hit more than 100 last month and felt good about it. That's kind of my goal. We'll see. A six month streak is awesome! Sometimes life just happens. How about the plank a month challenge lol? Good thing about phone pictures...there are usually lots of crappy ones that can easily be deleted!! Sounds like spring may be a good time to start a new streak!! oohhh and I thought you had some good excuses!! Outstanding job with the streak!! I like to have a good no-goal period after a time of serious dedication. Enjoy the RnR and knowing you have accomplished big things! Of course... this is weeks after your post, and I can't help but wonder if you have new goals now!